Enchanted gardens, magical multicoloured lanterns and a flourish of kaleidoscopic lights. These are just a few of the highly anticipated features on display every year at Montreal’s Gardens of Light event. You definitely don’t want to miss this popular event as the Botanical Garden is transformed into a magical fairy tale land. Located only steps away from the Le Botanik condos, come and experience this wonderful blend of lights, colour and traditional Chinese culture just around the corner from your home. The Gardens of Light event is on display at the Chinese Garden and the Japanese Garden. The Chinese Garden features hundreds of traditional multicoloured lanterns that tell the story of the life of the Chinese Emperor, the “Son of Heaven.” Adorned with bronze cranes, turtles and hundreds of intricately constructed lanterns, the pathways of the Chinese Garden are full of magical and mythical excitement. In sharp contrast, the Japanese Garden has no lanterns at all and instead offers visitors a peaceful, quiet and calm experience. Softly glowing spotlights illuminate areas in the garden as well as parts of the pathways, ponds and streams. Light and breezy music plays in the background complementing this enchanting light experience as you stroll around the grounds. The dazzling artistic presentation of lights emphasizes harmony and it is the perfect setting for peaceful contemplation. The Gardens of Light event takes an amazing amount of hard work and about a whole year to bring to fruition. Amazing! As the Gardens of Light festival came to a close last year, planning had already begun for this year’s festival. 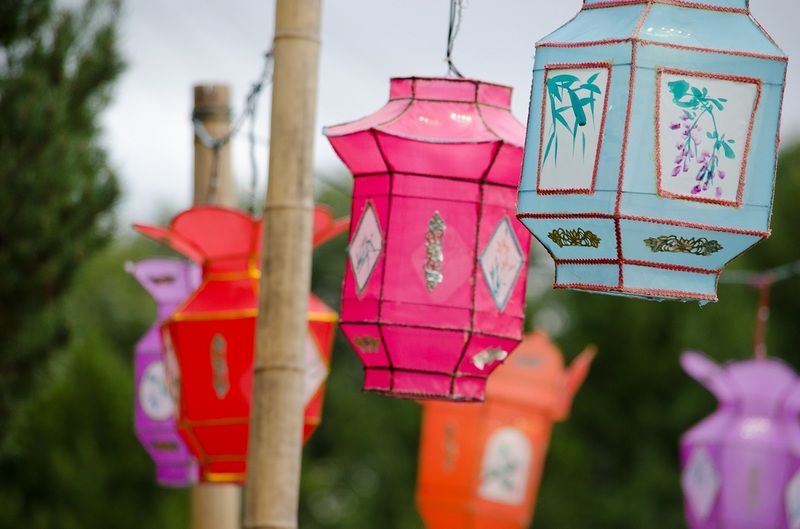 Every fall, experts in Montreal choose a theme for the following years’ festivities and they begin devising precise drawings for each lantern that needs to be created. These drawings are then sent to Shanghai where artisans make each individual lantern by hand. In the spring, the finished lanterns are sent back to Montreal where they are met by a team of experts who work diligently for over a month installing the wiring and setting up the lanterns for their debut in September. The end result is absolutely mind-blowing and a must-see Montreal event. This year the festival started on September 2nd and runs until October 31st. Now one of Montreal’s leading fall attractions, the Gardens of Light event appeals to pretty much every age group. The grounds are open everyday from 9am until 9pm however it is best to come around dusk so that you can truly experience how the appearance of the gardens change as the sun goes down. If you want to avoid the crowds, come on a weekday or when it is raining. Seriously consider grabbing an umbrella and walking over the gardens from your Le Botanik condo. Only a few minutes from your condo, you can have these idyllic gardens all to yourself with a good pair of rain boots and a smile. Enjoy!